Well, we’ve found out what it takes to get Congressmen pissed off about being lied to under oath these days: .289/.371/.516, with 569 home runs, 1834 RBI, and 3018 hits. The chair of the House Committee on Government Reform, Tom Davis III, has asked for information from MLB about Rafael Palmeiro’s positive steroids test. 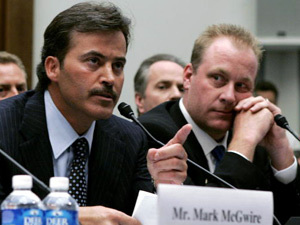 The committee is expected, says Congressional Quarterly, “to pay close attention to the timeline in baseball records” to determine whether the juice might have been responsible for the convincing bristle in Palmeiro’s mustache as he denied ever having been juiced. Us ordinary folk, we just have to settle for writing a letter to the editor when we’re outraged. Congress is special. They can do something! They can order Palmeiro to shave that mustache and let them test every hair if they get a mind to. You close followers of Congress in the audience will note that this is the first time Congress has paid close attention to anything since their surprisingly close interest in Mary Carey’s gubernatorial campaign. Too bad Palmeiro can’t be impeached! Think of the lesson that would teach America’s children about the seriousness with which Congress takes their duty to . . . uh . . . do whatever it is they do. Has the White House issued marching orders on Palmeiro yet? Then again, if it does turn out that Palmeiro lied brazenly to Congress, then surely Karl Rove won’t waste any time before hiring him. After all, lying smoothly under oath is a skill that could come in mighty handy at the White House as Patrick Fitzgerald’s Amazin’ Prosecutin’ Machine keeps rolling. Acting as if I’m a real columnist having a lazy day, I present a “News and Notes” column! 1) Headline in the Sun-Times following the Palmeiro news: Caught ‘roid-handed. Another good headline this week, despite not being baseball-related, was the Trib’s headline announcing the appointment of a federal monitor to watch the city’s hiring practices: City gets a Hall monitor. I imagine the headline writers are all staying up late these days practicing their headlines in the hopes of Daley being indicted. Me, I’m just practicing my gleeful chortle. Maybe I’ll get to warm it up chortling over Rove. 2) Palmeiro and Sandberg are linked yet again, this time in Sandberg’s Fire Sermon in Cooperstown on Sunday being followed so closely by Palmeiro essentially giving back his “Redeem in five years” ticket to the Hall. Those of you up on Cubs gossip will know how they were linked before, but if you need a refresher, contact me in some way that enables me to tell you the story while not being sued for libel. 3) Albert Pujols has stolen 11 bases this season without being caught. Next up for Prince Albert: some work in the offseason on his change-up so he can pick up some innings out of the bullpen. 4) Speaking of running, poor Lenny Harris, in legging out a three-run double against the Cardinals the other night in Florida, catapulted himself to the top of my list of worst baserunners in the game. He’s been a slow runner for years, plagued by leg and weight problems, but these days, his build is Kruk-like and he runs as if he’s on two peglegs. If this were a backyard whiffleball game, everyone would agree on special slowness rules for his ghost runner. 5) TV Guide is changing its format to not have nearly so many listings. How will I ever know when Scooter’s going to grace my television? I guess I’ll have to go to Jeanniezelasko.com to find out. I wonder if Jim has any thought about the changes to TV Guide? 6) In a discussion at work the other day about how to encourage bloggers who have written about our products, the idea of just contacting them with a thank-you came up. Or maybe we should send them minor-league baseball tickets? 8) After today, there’s a third of the season left, and Ken Griffey Jr. has still not visited the DL. 9) For a while a few weeks back, an image search for Johnny Damon brought up a certain pumpkin as the fourth response. It’s fallen back to ninth lately. Get to work, readers! 10) The Post-Dispatch reports today that the Cardinals are, after all, leaving KMOX and buying 550 AM KTRS. I think it’s a big mistake, as do many other Cards fans, and I’m sad to hear about it. KMOX was the Cardinals for me for my childhood. But this is really a topic that deserves its own post soon.